I love these colors together. The blue/teal/green combination reminds me, of course, of the Gulf of Mexico and the ocean ... looking at them it's easy to get lost, transported to a sailboat somewhere called Nowhere. The dark brown is so strong. Love it. And so I had to make a quilt, because one can never make too many quilts, I say. I've been gathering these fabrics over the last few months, along with a bunch of others that use brown ... I've decided brown is the new turquoise/teal, it goes with everything and looks decadent. 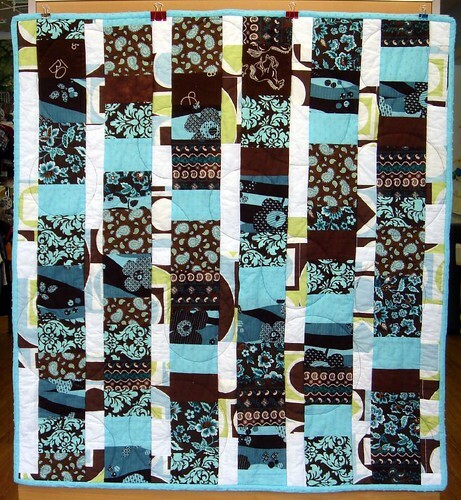 This quilt was initially inspired by this one created by One Shabby Chick. If you haven't visited her site yet you must. She uses such wonderful fabrics and creates the neatest things. 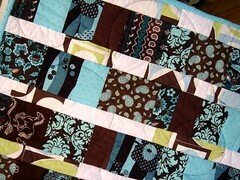 To make this quilt I cut the darker fabrics into shorter pieces (2-6" long) all with a 5" width. I cut the lighter pieces into longer strips (6-10" long) 2.5" wide. I then sewed two really long strips, one with each width of fabric. When I thought they were long enough I sewed the two together, cut strips the length I wanted, and sewed the newly cut strips together. Pretty simple. The quilting is done both in the ditch and in big random circles. To do the circles I traced two different sized circles onto freezer paper. I pressed the freezer paper onto the quilt, stitched, removed the freezer paper, repositioned it, stitched, and repeated. I did pin the freezer paper on the larger circles after the first two, the piece of paper was so large that it was a little harder to work with. Oh, I also tried spray basting for the first time. I was very hesitant but read some good online reviews and thought it'd be fun to try (and a time saver). Overall I was happy with it. I did do some pinning, just to be safe, but not nearly as much as usual. Pretty cool stuff. 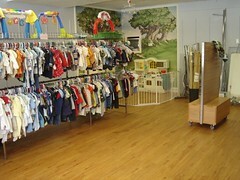 Below is a little idea of the progress at the store, kind of "before" and "during" pictures. 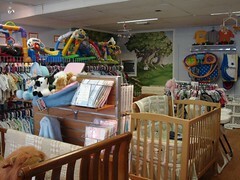 This is just one room, about 1/3 of the total store area, the other larger part of the store is still pretty full. This room should be completely empty early next week. I LOVE that colour combo too but hadn't though of using it in a quilt- turned out really well...sophisticated and grown up - lovely...you may have inspired me! Love the color combo, my niece just painted her bedroom these colors. 2 wall teal and 2 dark brown! I was going to ask for progress photos of the store closing. Then I thought, "be careful for what you ask for." I remember that room freshly painted and so packed we were convinced there just wasn't another inch to put anything anywhere. I love this combo too! Lately I've been seeing it everywhere from cloth hangers to Vera Bradley. The quilt is beautiful of course! Aww - thanks! 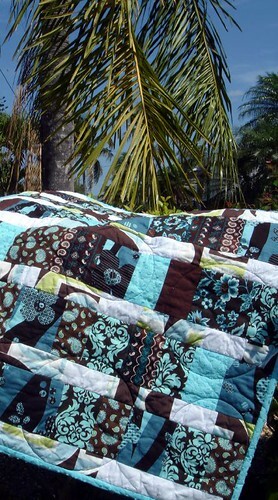 As soon as I saw the quilt it actually reminded me of Hawaii! Then I saw the nice link to me! 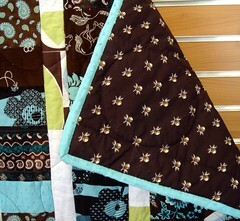 You are so talented and just blow me away with all your quilts! Such a pretty color combination. And what a beautiful quilt. Oh! Oh! I LOVE those color combos! I may not know much about quilting, but I know what I like. Thanks everyone! I'm loving the colors, so much so that I have another quilt in the works that uses them. 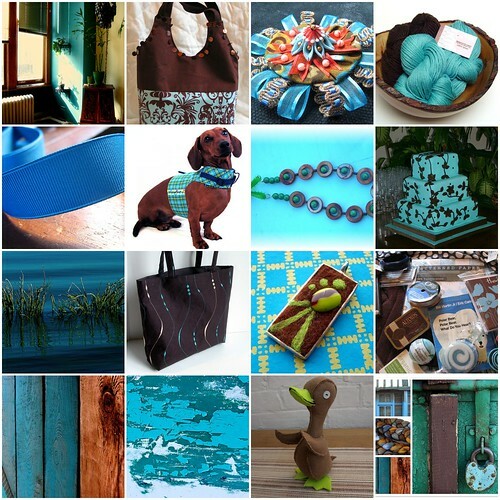 Lovely colour combination and thank you for adding my bag in your mosaic of inspiration.